A TV ad several decades ago stated with an air of authority that "dogs love cheese." No reports were cited and no canine polls performed, yet marketers hoped its mere repetition would drive the public to buy the cheese-flavored snack for their dogs, regardless of whether the claim was true. A similar thing happens each year in some of our most popular tourist destinations. The statement "the Navajo Sandstone is an ancient windblown sand dune deposit" is repeated by park rangers and interpretive signs in dozens of parklands in Utah alone. The average tourist is likely to "buy it." But is it true? The Navajo Sandstone forms some of our nation's most impressive scenery, yet the scale of this sand deposit is hard to imagine. 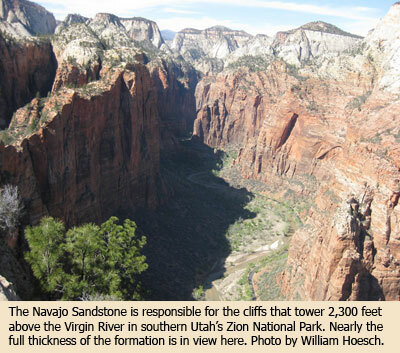 For example, the 2,300-foot-high cliffs at Zion National Park represent the exposed edge of a gigantic sheet of sand that once stretched from southern California to central Wyoming, and from Idaho to New Mexico. Bury the entire state of Texas to a depth of 285 feet and you have some idea of its volume. The quartz sand is not piled horizontally, but is instead arranged as internally layered cross-beds that tilt 20-30 degrees to the south and southeast. Strong currents (water or air) are required to produce this effect. The sandstone is nearly barren of fossils, but in occasional lens-shaped limestone pockets in between some of the big dune-forms are found fossil clams, brachiopods, ostracods (microscopic bivalves), a variety of dinosaurs, and plant remains that include permineralized wood (conifer), horsetails (equisetum), and ferns. Some of the clam shells are current-aligned, and at least one is arguably a marine form, which is not surprising, for the Navajo Sandstone interfingers with marine fossil-bearing strata to the west. The place from which all this quartz sand was eroded has long mystified geologists, but in 2003 the Appalachian region was identified as the likeliest source area! An immense transcontinental "river system" is imagined to have delivered the sand. A 1975 study by scientists Freeman and Visher (Journal of Sedimentary Petrology, 45:3:651-668) provides some important insights as to the origin of the Navajo Sandstone. The investigators pointed out that underwater sand dunes are known to accumulate on portions of the sea floor swept by strong currents--for example, beneath the North Sea. Superficially they look a lot like desert (windblown) sand dunes, but careful analysis of their grain size distribution reveals major differences. It turns out that disaggregated sands from the Navajo Sandstone match very well with modern submarine dunes, and very poorly with desert dunes. If the Navajo Sandstone formed underwater, as the data seem to indicate, then one must imagine water depths on the order of 300 feet and current velocities of 4 feet per second across large portions of North America! Freeman and Visher also observed a bedform called "current lineation," which so far has been found only in marine dunes. Furthermore, folds in the Navajo Sandstone indicate that thicknesses in excess of several hundred feet were in a water-wet and unconsolidated state at the same time. This too suggests rapid underwater burial. No amount of marketing or repetition can change the fact that the Navajo Sandstone bears the marks of having been deposited in underwater, Flood-like conditions. We weren't there to see it deposited and there remains much mystery, but the Genesis Flood continues to provide a credible framework for interpreting its origin. Cite this article: Hoesch, W. 2008. Marketing the Navajo Sandstone. Acts & Facts. 37 (6): 14.